Common container sizes include 20’ and 40’. This is useful for when you have a very large quantity of goods to ship. 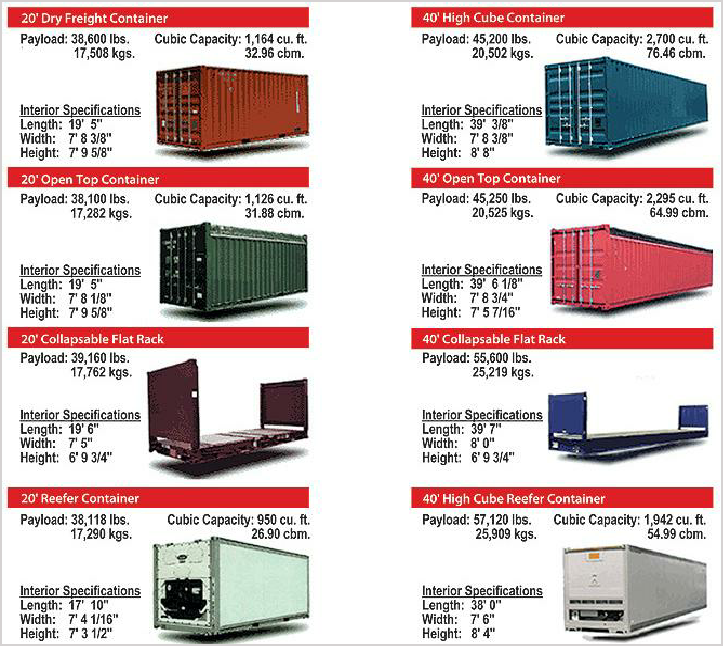 The dimensions for each are listed below for you to adequately determine what size will best suit your shipping needs. If your shipment cannot fill an entire container then you may ship your goods LCL (Less than Container Load. For this type of shipment your cost will depend on the volume that you will be shipping. Cargo must fit into a 20’ or 40′ sea freight container and must be boxed, crated or palletized. Palletized refers to cargo that is stacked together on a pallet and shrink-wrapped. Palletized ocean freight has a higher probability of reaching the destination without damages. When shipping your personal effects it is your responsibility to safely and securely pack your goods unless you request full-service shipping from IVL. All LCL shipments must be boxed, crated and/or palletized and labeled in order to be accepted by the carrier. Please contact an IVL representative who can handle all arrangements for your full-service shipping or provide you with the necessary assistance for your LCL packing for transport.